On our ‘About’ page, we describe Matrise as a blog that focuses on the topics of VR and Consciousness, and the related Science & Philosophy. In this entry, we will discuss why we find both Science & Philosophy essential and how the disciplines compliment each other. The entry is apologetic of Philosophy as a discourse, and especially critiques the philosophy of Scientism and other extremes of logical positivism — of which the former can be understood as an ignorance of the role of philosophy in general. The discussion is highly relevant as this is a worldview increasingly adopted by young people and promoted by popular science figures. The danger is a spread of anti-intellectualism, which ironically is going on under the flag of science, and further even tries to adopt its authority. It should be noted that although the entry critiques some ignorant science communicators, it is not the aim of this entry to argue philosophy in any way triumphant over science. The aim is rather to replace “versus” with “and”, and illustrate their mutual dependency. Like my philosopher friend and colleague Deborah G. Johnson once said of her technology criticism: “I prefer to think of my role as similar to that of an art critic” — an art critic loves art, and similarly, in this entry, my critique is out of love for the scientific discourse. It is, by far, not directed at the conceptual core of science, but rather towards the bad tendency that may be had towards it. In my occupation as a Ph.D. fellow, I ought to, and do, value both science & philosophy, and the main argument of this entry will be the inseparability of the two disciplines and the beauty of their interplay. 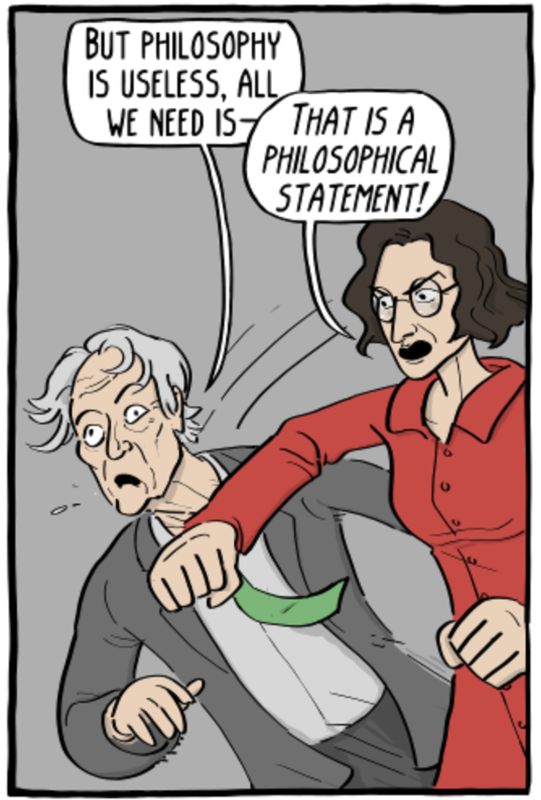 Illustrating excerpt from “The Philosophy Force Five vs the Scientismists” by Existential Comics. The left guy seems to be Richard Dawkins. Original can be found here. It may benefit us to personify the attitude towards science and philosophy that we are criticizing with an example. In 2010, the late brilliant Professor Stephen Hawking declared that ‘Philosophy is Dead’, and that the torch guiding the quest for knowledge had been passed to scientists rather than the philosophers. The strong irony present is obviously how Hawking argues the death of philosophy in terms of philosophical arguments, thus illustrating the futility of his statement simultaneously. In his book, “The Grand Design”, Hawking writes that metaphysical questions such as the meaning of life and the nature of reality traditionally were questions for philosophers — but that now, alas, philosophy is dead. Luckily, however, Hawking himself comes to the rescue: further in the book he writes that the “purpose of this book is to give the answers that are suggested by recent discoveries and theoretical advances” — thus pronouncing ever more clearly that his book is one of philosophy rather than science — but which reasons on asserted scientific facts. Revolutionary, indeed. Why did not Philosophy think of just looking at the answers that were suggested by the facts? The whole field of Philosophy is dead, but Hawking has taken it up as a side project and written a philosophical book, so we need not worry. A critical point that illustrates Hawking’s misunderstanding here, is how he announces that his book discusses “the answers that are suggested by science”. His attitude is therefore that the physics always imply its metaphysics; that descriptive facts of the world also tell of their own meaning, that the solution is always innate in the problem. The situation is that Hawking, of course, has a certain philosophy, he is simply not critical towards his acceptance of it. His assertion is easy to critique, however, by arguing that science does not suggest anything — Hawking, however, suggest several things, and these may be great things and great ideas! It is easy to agree with his philosophy as broad as it is: through observation, we agree on facts, and with logic, we reason on the meaning of these facts. Hawking is philosophizing on scientific discoveries and theories, and that would be a great thing had he only been aware that was his approach. There is not (necessarily) anything wrong with his philosophical stance, except in exactly how it claims to not be a philosophical stance. The saying “Philosophy is Dead” instantly revives Philosophy as the utterance itself is a philosophical statement. The sentence achieves the same futility as a person grabbing a megaphone to announce that megaphones don’t really work. 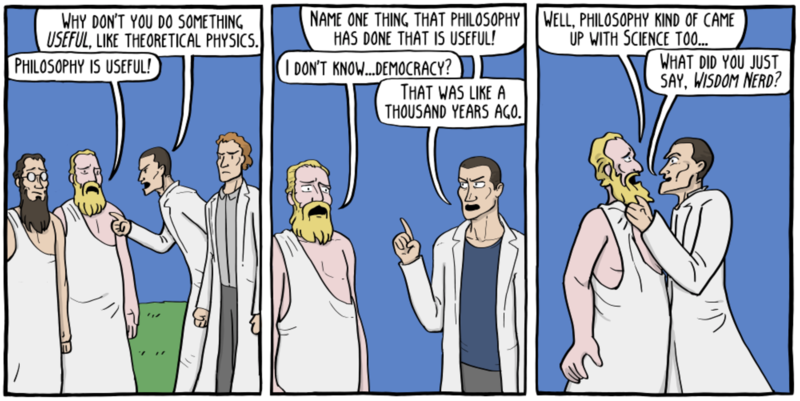 Illustrating excerpt from “The Philosophy Force Five vs the Scientismists” by Existential Comics. Original can be found here. Unfortunately, Hawking as a popular science communicator is not alone in his ignorance. For instance, both Neil Degrasse Tyson and Bill Nye (the Science guy), has also publicly addressed their concerns over Philosophy. Neil deGrasse Tyson has called Philosophy ‘useless‘, advising bright students to stay away from it, and stated that Philosophy is not “a productive contributor to our understanding of the natural world”. He has also said that he is concerned that “philosophers believe they are actually asking deep questions about nature”, and described the venture of philosophy as being “distracted by questions”, and therefore not able to contribute anything to our understanding. Our best example of the problem that lies at the core of these poor critiques, however, is given by Bill Nye in a YouTube video where he is faced with a question from a Philosophy major on what his take on Philosophy is. Nye addresses the topic of Philosophy by introducing several great philosophical problems such as the nature of consciousness and reality, only to dismiss them based on the argument, or, rather saying, that he is quite sure that reality is real. Deep dive. The best illustrative quote would perhaps be his rejection, and total misunderstanding, of Descartes’ famous argument ‘Cogito ergo sum — I think, therefore I am.’ Nye comments on this: «Well, what if you don’t think, do you not exist anymore? You probably still exist even if you don’t think about existence”. I hope I don’t have to explain why this is ridiculous. At the end of the video, Nye goes further into depravity when he presents a thought experiment to validate his lack of philosophical skepticism. Nye simply asks the questioner to drop a hammer on his foot. This kind of argumentation is classic and has long before been termed ‘argument ad lapidem‘: a logical fallacy that consists of dismissing a statement as absurd without giving proof of its absurdity. What is even more unfortunate, however, is that this was a brilliant opportunity for Nye to illustrate how science actually benefit philosophy, as there is much evidence from scientific experiments that show we may not always be able to trust our senses, and even our own reasoning (read for instance about the fascinating split-brain experiments, or even here on Matrise on how we can fool our senses to achieve Virtual Embodiment or our entry on The World of Illusions). For those who can emotionally afford to experience a few cringy minutes, Bill Nye’s YouTube video can be watched here. 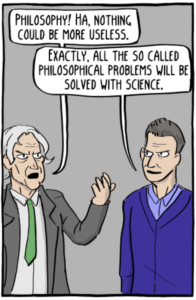 Illustration borrowed from Existential Comics’ “Philosophers And Physicists” available here. The problem with a defiant attitude towards Philosophy is that it promotes an ignorance of thorough, critical thinking. Our sciences are infused with philosophy and we need philosophy to reason on our discoveries and their meaning, and further to discuss what we want to research. The best way to understand this is that our scientific methods are an accomplishment of philosophy with the epistemology, methodology, and rationality underlying it: the validity of the scientific discourse is argued for in philosophical terms. Science is not given, it is a construct: our scientific methods have been developed, and are still being discussed and developed to this day. Science & Philosophy does not compete with each other; philosophers compete with philosophers; the logical positivists compete with the idealists, and the rationalists compete with the empiricists. 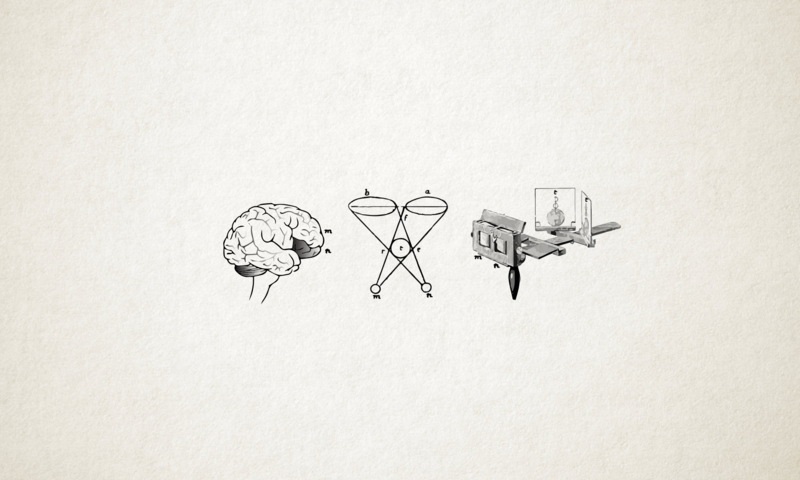 Science is conceptually within Philosophy, and one of its greatest accomplishments. They do not exist separately. What Philosophy can teach us, and which perhaps especially the field of Existentialism stresses, is to critically reinvestigate our beliefs. It stresses the possibility of each individual to realize their own potential, and also implicitly, the possibility of failing to do so. Heidegger, for instance, a philosopher which we have discussed in several entries earlier is concerned with authentic existence. Allowing an uninvestigated myth such as Scientism to guide one’s life could be a good illustration of Heidegger’s “Das man”; which could be said to be his impersonated term for the norms and culture we blindly accept. It is hard to translate “Das man”, but Heidegger defines it as a possible state of Dasein’s Being. A common way to explain or translate “Das Man” is to the “They” or the “One”, as in “One should always get up early”. Heidegger explains that “‘Das man’ prescribes one’s state-of-mind, and determines what and how one ‘sees'”. This can be read as that culture, or uninvestigated norms that provide a narrative to our existence determines how we fundamentally interpret reality. In the words of crazy Terence McKenna: «Culture is not your friend!» Rather than to accept the cultural and societal narratives, we should critically investigate them, and not let anyone dictate a narrative for us that we should just subscribe to. What narratives in our society do we subscribe to, in relation to who we are and what we want? What did we adopt from our parents and our society in relation to how we understand the basic principles of the world? 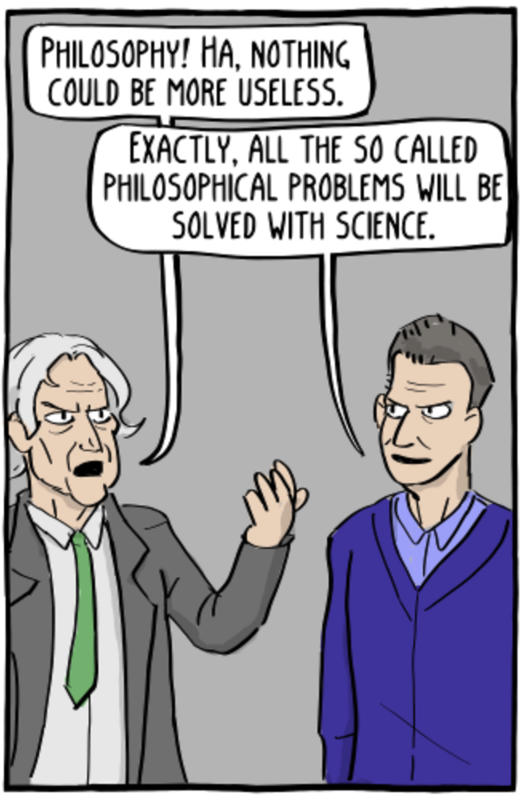 Illustration borrowed from Existential Comics’ “Philosophy News Network: Philosophy Solved” available here. It is a very naïve view, indeed, to believe that the solutions to the problems of mankind may be solved if all the young, bright minds go into the natural sciences. We need not only to find out how nature works, but also how we ought to work with it and further with each other. Science alone does not tell us what we should do in our lives. No scientific fact can alone provide us meaning, or say what we should value and pursue. Dismissing philosophy is a dismissal of thorough criticism, it is being attached and dependent on one’s settled, foundational narrative of how the world works. Concluding this entry is an accompanying text to one of the comics in this entry on Scientism by Corey Mohler. As this entry has not necessarily been very explicit on what Scientism is, it may be informative to read his very clear presentation on this.